East Hampton Village Hall is located at 27 Main Street, East Hampton NY 11937; phone: 631-324-4150. Photo: Home in the Village Historic District, East Hampton Village, NY. The Historic District was listed on the National Register of Historic Places in 1974 and expanded in 1988. Photographed by User:Americasroof (own work), 2008, [cc-by-3.0 (creativecommons.org/licenses/by/3.0)], via Wikimedia Commons, accessed August, 2015. The East Hampton Multiple Resource Area was listed on the National Register of Historic Places in 1988. Portions of the content of this web page were adapted from a copy of the original nomination document. Adaptation copyright © 2015, The Gombach Group. The village of East Hampton  is an incorporated village of 2,000 residents, located approximately 100 miles east of New York City on Long Island's south shore. The village includes a relatively flat land area of approximately 2,500 acres, bounded by the Atlantic Ocean to the south, Georgica Pond to the west, Montauk Highway and the Long Island Railroad to the north and the Cross Highway to the east. Large areas of open space remain present at the south and west sides of the village near Hook Pond, Georgica Pond and Georgica Cove, and a large and nearly continuous sand dune separates developed portions of the village from the ocean. Land use in the village is overwhelmingly residential and, in general, building densities are highest north and east of the geographic center of the village. Seventeenth and eighteenth century houses are concentrated at the heart of the village on or near a seven-acre village green. A small but intensively developed early twentieth century business district is present about one-half mile northeast of the green and an area of large late nineteenth and early twentieth century summer estates is located in the southwest quadrant of the village. The majority of East Hampton's historic resources (270 contributing features) are concentrated within the East Hampton Village Historic District Boundary Expansion. Located at the center of the village, the original 1974 National Register Village Historic District and its contiguous expansion area follow a northeast-southwest axis approximately two miles in length and half a mile in width. The principal streets within the expanded district are Main Street at the northeast end, Ocean Avenue and James Street near the center, and Lee Avenue and Lily Pond Lane at the southwest end. Other streets within the district intersect these northeast-southwest streets at right angles. The center of the district is occupied by a seven-acre village green laid out in the mid-seventeenth century and including an early burial ground and watering pond. The green is surrounded by a group of important late seventeenth and early eighteenth century vernacular frame houses as well as significant religious, and institutional buildings from the early twentieth century. The north end of the district includes several large and distinguished later eighteenth and early nineteenth century houses on Main Street, a block of early twentieth century commercial buildings on Main Street at the north boundary, and intact late nineteenth and early twentieth century residential development of Huntting Lane and Dunemere Lane. The south end of the expanded district is characterized by large late nineteenth and early twentieth century summer estates with large and professionally landscaped grounds. The largest of these houses are sited on semi-secluded lots generally on or behind the dunes south of Lily Pond Lane. Two smaller districts are located north of the expansion district and adjacent to the northern boundary of the incorporated village. The North Main Street Historic District is located at the intersection of North Main Street and Pantigo Road and includes a concentration of significant nineteenth-century houses grouped around a small triangular burial ground. The district also includes an early twentieth century church and the early nineteenth century Hook Windmill, listed on the National Register in 1978 as a component of the Long Island Wind and Tidemill Thematic Resources nomination. The Pantigo Road Historic District includes an intact group of significant vernacular houses on both sides of Pantigo Road and along the east side of Egypt Lane and Accabonac Road. These houses range in dates or construction from c. 1715 to c. 1916. The Buell's Lane Historic District is located at the northwest side of the village along both sides of the principal road west to Sag Harbor. This district includes a small but intact concentration of modest, late nineteenth and early twentieth century houses and a church related to each other by a common development history, similar construction methods and late Victorian period design elements. The Jericho Historic District consists of a group of three early nineteenth century frame houses located at the western edge of the incorporated village near the intersection of Montauk Highway and Jericho Road. The houses compose the nucleus of a small neighborhood formerly referred to as Jericho. In addition to their proximity, the houses are linked by their distinctive Federal style detailing. All three houses were built by members of the Jones family, prominent eighteenth and nineteenth century East Hampton builders. The Briar Patch Road Historic District is located at the southwest edge of the village on a secluded and heavily wooded site on Georgica Pond. It consists of six frame houses built between 1897 and 1931. Of these, five were built as, or are associated with, retreats and studios. The houses are in most cases rustic in their character and setting and often reflect adaptations of traditional vernacular forms common in East Hampton. The Jones Road Historic District is located a short distance southwest of the East Hampton Village Historic District Boundary Expansion on both sides of Jones Road and along a short stretch of Apaquogue Road. The district includes a mid-eighteenth century farmhouse and barn, a nineteenth century boarding house and a series of seven late nineteenth and early twentieth century houses, many of which are designed in the Colonial Revival mode with references to East Hampton's vernacular architecture. The Egypt Lane Historic District is located at the east side of the village on Egypt Lane between David's Lane and Pondview Lane. It includes three significant eighteenth and early nineteenth century vernacular houses relocated to Egypt Lane between 1900 and 1930. The district is primarily significant as a collection of rare and largely intact early residences; however, it also derives significance as a vivid illustration of early twentieth century antiquarianism in East Hampton. In addition to the historic districts, the multiple resource area includes 24 individual property components randomly distributed at the periphery of the village core. Seven of these components are located on residential streets at north end of the village. They include the c. 1725-1750 Percy Hammond House on Hither Lane, the c. 1725-1750 Hedges-Talmage House at 61 North Main Street, the c. 1725-1750 Fithian House at 7 Fithian Lane, the c. 1725-1750 Barnes-Hassam House at Egypt Lane, the c. 1725-1750 William He Babcock House on Middle Lane, the c. 1750 Conklin-Eldredcre House on Egypt Lane, and the 1799 Miller Dayton House at 19 Toilsome Lane. The majority of these houses are located on small lots in neighborhoods now characterized by twentieth century suburban residential development. Three individual property components include houses dating from the early to mid-nineteenth century. The 1829 Josiah Dayton House is located at northwest side of the village at 35 Toilsome Lane on a relatively large lot and includes several former farm buildings. The c. 1840 Baldwin Cook Talmage House, is located at the southwest side of the village on Briar Patch Road. The house and its complex of contributing farm buildings remain on a large open lot but have recently lost most of their historic farm acreage to residential subdivision and development. The 1876 George Eldredge House, is located at the north side of the village on a small village lot at 84 Egypt Lane. Two individual components were built for social organizations. The 1897 Odd Fellows Hall, is located in East Hampton's business district at 26 Newtown Lane, a short distance north of the East Hampton Village Historic District Boundary Expansion. The 1923-1924 Maidstone Club, is situated on a dune overlooking the ocean at the end of Old Beach Lane. The remaining 12 individual property components of the multiple resource area are large summer residences built between 1891 and 1928, usually in close proximity to the ocean. They include the 1891 Sedgewick-James House, the 1897 F.S. Philips House, the 1926 Ellery James House, the 1927-1928 Grantland Rice House, the 1927-1928 Ring Lardner House, and the 1928 Nathaniel Campbell House on West End Road near the shore at the southwest corner of the village, the 1920 Herbert Coppell House and the 1926 Eltinge F. Warner House, nearby on Lily Pond Lane, the 1898- 1899 Albert Herter House, at the head of Georgica Pond off the Montauk Highway, the 1910 Francis Newton House, on Georgica Road near Georgica Pond, the 1917-1918 Robert Appleton House, near the beach at the east side of the village off old Beach Lane, and the 1922 William Jenny How, Component 26) at 140 Egypt Lane. The multiple resource area includes an unusually large number of moved buildings in several of its historic districts and among its individual property components. The majority of these buildings were moved during the period of significance (pre 1937) and have been evaluated as significant in the context of East Hampton's architectural development. Several buildings moved since 1937 were also classified as significant, either because they represented architecturally important but rare building types, e.g., eighteenth century saltbox houses, or because the circumstances of the move did not significantly impair the integrity of the building's design or setting, e.g., large summer houses moved back short distances from the beach. These issues are discussed in greater detail in the separate descriptions which accompany each district or individual property component. A wide range of building types, architectural styles, periods of construction and historic landscapes are represented in the multiple resource area. The earliest of these date from the seventeenth century and are both included within the expanded East Hampton Village Historic District. They are the Village Green, a seven-acre commons laid out in 1648 and the Mulford House at 12 James Lane, a two-story heavy timber frame house built c. 1680 and originally designed with a one-room-deep, center chimney floor plan, multiple gables and small leaded-glass casement windows. The present "saltbox" form of the house is the result of several early eighteenth century alterations. Two common house forms with somewhat similar ground floor plans account for most of the surviving examples of East Hampton's vernacular residential architecture between 1700 and 1775. Popularly referred to as the saltbox and the Cape Cod, both basic house types generally feature ground floor plans with center entrances, massive center chimneys, two-room-deep layouts with kitchens at the rear and southern orientations. Both employ heavy posit and beam construction and in East Hampton; both were originality sheathed in large wood shingles at the exterior. The two house types are differentiated by their roof lines: the saltbox features a full second story at the facade and a single story elevation at the rear, resulting in roof planes of equal pitch but: unequal length, whereas the Cape Cod, while including some usable second story space, incorporates single story front and rear elevations and a symmetrical roof line. A sub-type of the saltbox represented in the multiple resource area is the half-house, a house form which features the basic characteristics of the saltbox, including its distinctive asymmetrical roof line, but with an abbreviated side entrance floor plan. Half-houses appear in some instances to have been built in anticipation of later extension into the full-blown center-entrance saltbox type. The multiple resource area includes a total of 14 architecturally significant early to mid-eighteenth century saltbox houses, a number of which were subsequently converted to full two-story houses by raising their roof lines at the rear. Originally concentrated in the vicinity of the Village Green and upper Main Street in the East Hampton Village Historic District Boundary Expansion, five have since been moved from their original sites and are nominated as individual property components in the multiple resource area and one is now a contributing feature of the Egypt Lane Historic District. The multiple resource area also includes two intact half-houses, both located within the expanded East Hampton Village Historic District, and two intact Cape Cod houses, one of which is included in the Jones Road Historic District and one of which is an individual property component on Egypt Lane . Later eighteenth and early nineteenth century resource types represented in the multiple resource area include full two-story, five-bay center entrance houses with central or flanking gable end chimneys and gable or gambrel roofs; several three-bay side entrance houses with one or two stories, gable roofs and chimneys on the entrance side of the plan; a group of wooden windmills, all built: during the first decade of the nineteenth century and an unusual Georgian style academy building with a clapboard facade, brick end walls and a distinctive cupola. The first of these building types, the full two-story house with a balanced center entrance facade, is represented by seven intact examples in the multiple resource area, six of which are concentrated along the upper portion of Main Street within the expanded village historic district. The remaining example is located outside of the village core at 19 Toilsome Lane. Despite differences in roof form (gable or gambrel) and chimney placement (center or flanking ends), the houses are generally similar in their scale and layout, heavy frame construction and plain exterior treatment. East Hampton's only surviving institutional building of this period, the 1784- 1785 Clinton Academy, located within the expanded East Hampton Village Historic District at 151 Main Street, is similar to some of these larger houses in its five-bay center entrance facade design and gambrel roof, but is differentiated from such comparable domestic buildings by its brick and clapboard exterior, broad piazza and cupola with domical roof. Two three-bay side-entrance houses from the mid to late eighteenth century also occur within the multiple resource area, not withstanding a number of later examples built in the Federal Style during the first three or four decades of the nineteenth century. Both eighteenth century examples of this type are located in the expanded East Hampton Village Historic District. The Gardiner house at 48 James Lane is one-story in elevation and features a transom window above the front door. The Mulford house at 146 Main Street is a two-story house. Both houses feature massive chimneys, which rise above the roof ridge at the entrance side of the plan and both retain narrow, multi-light windows and shingle exteriors. Three windmills dating from the first decade of the nineteenth century are present in the multiple resource area, representing a building type common in East Hampton and other neighboring Long Island villages during the later eighteenth and early nineteenth centuries. Although gearing mechanisms differ, the three mills are housed within similar octagonal towers with battered sides, domical or boat-shaped roofs and shingle exteriors. Two of the three mills are located within the expanded village historic district at 14 and 36 James Lane. The remaining windmill is located at North Main Street in the North Main Street Historic District and was listed on the National Register in 1978 as a component of the Long Island Wind and Tidemill Thematic Resources. East Hampton's early nineteenth century architecture initially represented a continuation of later eighteenth century vernacular building forms modified with Federal style details and proportions. Center entrance and side entrance houses with gable roofs and shingle exteriors continued to be built; however, windows became proportionately larger and design elements, such as entrance enframements and cornices, were elaborated with pilasters, entablatures and attenuated cornice moldings. Similar treatments appear at the interiors around doorways and in the design of mantelpieces. Several houses in the multiple resource area feature elaborate leaded-glass door transoms and interior features such as elliptical archways, rosette-carved corner blocks and, in one instance, an entablature panel detailed with a pineapple carved in raised relief. An important concentration of early nineteenth century houses with Federal style detailing occurs in the Jericho Historic District, where three side entrance houses with elaborate doorways and interior woodwork are clustered. Several large center hall houses with flanking rooms are present from this period as well, including the 1829 Josiah Dayton House at 35 Toilsome Lane and the c. 1835 Abraham Huntting house at 15 North Main Street in the North Main Street Historic District. The Huntting house incorporates a distinctive Federal style entrance with sidelights and attenuated pilasters and retains its original twelve-over-twelve window sash. The influence of the Federal style is also evident in the early nineteenth century Dickerson house at 129 Egypt Lane in the Egypt Lane Historic District and in the distinctive early nineteenth century entrance to the eighteenth century Lyman Beecher House at 84 Main Street in the expanded village historic district. A relatively small number of mid-nineteenth century houses occur in the multiple resource area. Of these, two house types are represented: the two-story house with a center entrance and a balanced five-bay facade and a smaller dwelling type of one or two stories with a three-bay side-hall plan and chimneys situated in the opposite gable end. After 1840, both house types generally featured six-over-six double-hung sash windows and vernacular Greek Revival style entrances and entablatures in addition to traditional heavy timber framing and wood shingle sheathing[. Examples are distributed randomly throughout the multiple resource area. The center entrance house type is represented by the c. 1840 Baldwin Cook Talmage House on Briar Patch Road while the side hall house type is represented by the one-story 1849 William Bennett House at 43 North Ham Street in North Main Street Historic District and the two-story c. 1850 Henry Tuthill House at 4 James Lane in the expanded village historic district. Houses built in East Hampton during the 1860's and 1870's illustrate picturesque forms and detailing and the introduction of new construction methods and materials. In some instances traditional house forms continued to be built but were embellished with broad roof overhangs and bracketed cornices as illustrated by the c. 1860 Jeremiah Mulford House at 140 Main Street and the 1873 John D. Hedges House at 74 James Lane, both located in the expanded East Hampton Village Historic District. Other houses of the period illustrate a wide range of picturesque house forms and styles new to East Hampton. Representative examples also located in the expanded village historic district include the Second Empire style William King House at 187 Main Street, built in 1872 with a distinctive mansard roof, the Italian Villa style summer estate house of Charles P.B. Jeffery, built in 1872-1873 on Jeffrey's Lane, and the adjacent Chalet style guest house on the estate, built in 1879. East Hampton's extensive late nineteenth century building stock is dominated by large-scale summer houses, built of light frame construction and typically designed in combinations of the Queen Anne and Shingle styles. Houses of this type began to appear in the late 1880's and continued to be built in significant numbers through the first quarter of the twentieth century. Common design characteristics include asymmetrical massing, picturesque roof lines composed of gambrel and or gable roofs, multiple dormers and tall, corbelled brick chimneys, multi-light window sash and unpainted shingle siding. Fanlights, Palladian windows and recessed porches are also common. More than 90 houses of this type are included in the multiple resource area, with the majority of them concentrated in the Summer Colony portion of the expanded village historic district. More modest, vernacular Victorian period houses and cottages with L-shaped plans, cross gabled roofs, shingle exteriors and decorative front porches are found concentrated in the Buell's Lane Historic District and in scattered locations elsewhere in the multiple resource area. The multiple resource area also includes two somewhat vernacular Victorian period frame churches, the 1894 Most Holy Trinity Roman Catholic Church at 79 Buell's Lane in the Buell's Lane Historic District, and the 1901 East Hampton United Methodist Church at 35 Pantigo Road in the North Main Street Historic District. In addition a simple Shingle style Odd Fellows Hall, built in 1897, is included in the multiple resource area at 26 Newtown Lane. The Colonial Revival style of the late nineteenth and early twentieth centuries is represented in the multiple resource area by half a dozen or more large-scale summer houses in the Summer Colony portion of the expanded village historic district, four modestly scaled, shingle-sided houses located in the Jones Road Historic District and designed to resemble local eighteenth and early nineteenth century prototypes, and six commercial buildings on Main Street at the north end of the expanded village historic district. There are also numerous instances of eighteenth and nineteenth century houses which were moved, remodelled and occasionally upgraded to reflect popular Colonial Revival tastes. In general, the buildings designed in the Colonial Revival style during this period are characterized by a simplicity of form and symmetrical facades. The larger examples of the style are frequently built with clapboard siding and embellished with finely scaled Adamesque details including corner pilasters, small entrance porticos with attenuated columns, modillion supported cornices, balustrades, tripartite and Palladian windows and, in one instance, a dormer crowned by an elaborate, half-round shell pediment. The smaller houses on Jones Road, built between 1910 and 1915, emulate East Hampton's vernacular traditions and are sheathed in unpainted shingles with Colonial Revival detailing used principally around the entrances. The commercial buildings in this style, located at the upper end of Main Street, are in most cases built of brick with a vocabulary of wooden and limestone forms and details including arched openings, splayed lintels with keystones, and modillion supported cornices. The former East Hampton National Bank at 27 Main Street, now housing the village offices, is one of the finest and most intact buildings related to the group, featuring a Neoclassical three bay center entrance facade with a round arched entrance and flanking round-arched windows, brick pilasters with limestone plinths and capitals, and limestone columns in antis. Other buildings in the group display unique refinements, such as Flemish bond brickwork or leaded-glass fanlights. The multiple resource area includes six distinctive house and studio combinations built for a small but influential group of artists working in East Hampton during the late nineteenth and early twentieth centuries. The earliest example of this building type is the Thomas Moran House and Studio (a National Historic Landmark) built in 1884 at 229 Main Street and located in the expanded village historic district. The informal design of the two-story frame house includes elements associated with the Queen Anne style (a turret, an oriel window, a corbelled brick chimney, and numerous small paned windows) as well as some characteristics of the local vernacular, including its relatively low height, lack of a prominent foundation, and its unpainted shingle exterior. An enclave of house and studio combinations, also designed with references to East Hampton's vernacular architecture, are concentrated in the Briar Patch Road Historic District. Built between 1897 and 1904 in a wooded and secluded section of the village, all but one of these houses are covered in unfinished wood shingles. Two examples, the John H. Roudebush house and the Lawrence Aspinwall house, feature saltbox-shaped roof lines. In contrast, the Herter Estate, built for artists Albert and Adele Herter in 1898-1899 at the north end of Georgica Pond, is an imposing and stylish collection of buildings reflecting Arts and Crafts and Mid-western influences. The Herter complex includes separate house, studio and stable buildings and is designed with stucco exterior walls, diamond-paned casement windows and hipped, tile-covered roofs. The final decades of significant development in East Hampton, i.e., 191.0-1930, were marked by the construction of imposing summer estate houses, often sited in close proximity to the shore, and several expensively built civic, religious and social facilities, most of which reflect the influence of historical eclecticism. During this period, variations of historic English vernacular architecture, including the Tudor and Elizabethan style, were especially prominent and account for the design of St. Luke's Episcopal Church (1910) and rectory (1916) at 18 and 22 James Lane, the 1911 East Hampton Free Library at 159 Main Street, the 1917 Lorenzo Woodhouse Playhouse at 80 Huntting Lane (all located in the expanded village historic district, as well as 14 estate houses, nine of which are included within the expanded village historic district, one of which is located in the Jones Road Historic District and four of which are included as individual property components 24,26,28 and 32. Most of the buildings in the multiple resource area which fall within this stylistic category are characterized by picturesque massing, prominent roof lines with multiple gables and the frequent use of stucco or stucco and half-timber exterior surfaces. Other design elements found among some of the residential examples of the style include diamond-paned casement windows, ceramic chimney pots and roofs with rolled eaves and/or gently curved surfaces suggestive of thatched roof forms. Although included within this group, St. Luke's church is somewhat unique in its stone construction and vernacular English Gothic design references. The 1922-1924 Maidstone Club on Old Beach Lane, on the other hand, is similar to some of the larger English vernacular estates of the period in its picturesque massing and the prominence of its hipped and gable roofs, but is differentiated from them by its enormity. An alternate form of historical eclecticism found in East Hampton between 1905 and 1930 is the Spanish Colonial or Mission style. Five significant houses in the multiple resource area built between 1905 and 1930 are designed with characteristics of these two related styles, including stucco or white painted brick exterior walls, pergolas with projecting joists, and hipped roofs with wide soffits and, in some instances, red tiles. All but one of the five examples are located near the ocean in the expanded village historic district. The exception, Eltinge E. Warner's Cima del Mundo, is located further south along the shore on Lily Pond Lane. The last significant building project undertaken within the multiple resource area's 1648-1930 period of significance was the Guild Hall, at 156 Main Street in the expanded village historic district. Begun in 1930 and completed in the following year, the brick building was designed in a modified Georgian Revival style, possibly inspired by the contemporaneous restoration of Colonial Williamsburg. The brick building houses a theatre and meeting space. Architecturally, it is characterized by flat and relatively plain brick walls, an arcaded entrance and an octagonal central mass surmounted by a lantern with a bell-cast dome. Detailed information regarding the eight historic districts and the 24 individual property components included in the multiple resource area nomination is included in the attached inventory forms and continuation sheets. The eight historic districts and twenty-four individual properties included in the Village of East Hampton multiple resource area are collectively significant in chronicling the development of an eastern Long Island community from its initial settlement in the mid-seventeenth century through its ascendancy as an affluent summer resort in the late nineteenth and early twentieth centuries. The components of the multiple resource area illustrate an unusually complete and well-preserved continuum of architecturally significant buildings and districts ranging from the vernacular timber-framed houses of the late seventeenth and early eighteenth centuries, to large and sophisticated examples of early twentieth century historical eclecticism designed by prominent regional architects. Historic districts present in the multiple resource area recognize significant concentrations of historic buildings that retain their settings and sense of time and place, or which encompass buildings related to each other by significant patterns of development or architectural design. Taken together, the component resources of the Village of East Hampton Multiple Resource Area provide valuable insight into eastern Long Island's long and distinguished cultural and architectural heritage. In 1648, the governors of New Haven and Connecticut purchased most of Long Island's South Fork from the Montauk Indians. Three years later, a portion of this purchase was sold to a company of English families from Lynn, Massachusetts, several of which had settled in the area now encompassed by the Village of East Hampton during the 1640's. The immigrants referred to their fledgling settlement as Maidstone, presumably in reference to their former homeland in Kent, England. Later, in 1662, the community was renamed East Hampton. The first settlers organized their community into a proprietorship, which held a vast tract of land east of the present village in common for pasturage. The settlement itself was laid out with an elongated common surrounded by deep and narrow home sites. Primitive dwellings and fences were widely spaced around the perimeter of the common. In 1654 a jail was built within the common, followed in 1656 by a thatched roof meeting house. Eventually a bog, located at the southwest end of the common, was dug out to provide an unobstructed source of water for livestock and a small strip of land adjacent to the resulting pond was reserved for burials. The common, or the Village Green as it is now referred to, thus became the nucleus of the growing settlement and, subsequently, its historic focal point. Located near the center of the incorporated village in the expanded village historic district, it is the only identifiable feature in the multiple resource area to survive from East Hampton's first generation of settlement. East Hampton adopted the laws of Connecticut in 1653 and joined that colony between 1657 and 1667. After the latter date, control of eastern Long Island passed to the colony of New York. However, because of the region's proximity to southern New England, cultural and economic ties with the New England colonies remained very strong well into the nineteenth century This close relationship is clearly evident in East Hampton's seventeenth and eighteenth-century architectural development, which closely paralleled that of other coastal New England colonies from the beginning. Early shelters consisted of wooden superstructures with thatched roofs and, external chimneys built of wooden cribwork with mud flues similar to those known to have been built in the Massachusetts Bay Colony. By the last quarter of the seventeenth century, East Hampton had developed to the point where more substantial and permanent buildings were practical for a number of property owners. Once again, the hamlet's English cultural affiliation was demonstrated by the house type that emerged. Typically it was built with a one-room- deep plan, heavy timber framing with interlocking joints, a massive internal fireplace, an oven and chimney unit with multiple flues and a steeply pitched gable roof. This house type was common throughout coastal New England during the seventeenth century and reflected the vernacular architectural traditions of medieval England. The multiple resource area includes one house with surviving fabric from this period, remaining on its original site at 12 James Lane in the expanded Village Historic District. Now referred to as the Mulford House because of its long association with that family, the two-story house, built for Captain Josiah Hobart c. 1680, retains structural evidence that would allow a fairly accurate reconstruction of its original, one-room-deep configuration. Evidence also indicates that the house was sheathed with clapboard siding and designed with small leaded-glass casement windows. The roof included twin pediments at the facade and was covered with wood shingles and surmounted by a massive brick chimney at the center, possibly embellished with pilasters and a corbelled cap. The current saltbox configuration of the house and its large wooden window sash reflect alterations effected by the Mulfords during the first half of the eighteenth century. By 1700, the village of East Hampton had become firmly established as a self-sufficient agrarian community with a population of over 500 residents. Dwellings built in the village during the first half of the eighteenth century generally conformed in design to two common vernacular New England house types of the period: the saltbox with its two-story entrance facade and one-story rear elevation covered by a gable roof with sides of unequal length, and the Cape Cod, a gabled one-story house type. Both building types were typically designed with two-room deep plans and massive internal chimneys, and both were constructed with heavy timber framing and shingled exteriors. Most appear to have been oriented southward with little regard for established street patterns or their appearance from public spaces. With the exception of coved plaster cornices on the facades of several surviving East Hampton saltboxes, exteriors were exceptionally plain, perhaps reflecting the puritanical values and strictures shared throughout New England during the colonial period. Some elaboration, however, was permitted inside, where distinctive wall panelling and chamfered beam edges illustrate a high degree of craftsmanship and pride. The multiple resource area includes fourteen significant eighteenth century saltboxes and two Cape Cods. Some of the better preserved examples of the saltbox house type are located within the expanded village historic district, including the Home Sweet Home Museum at 14 James Lane (c.1700-1750), the Jonathan Osborn house at 101 Main Street (c. 1700-1750) and the Osborne Office at 135A Main Street, built between 1700 and 1750 and moved back on its original lot c. 1898. The eighteenth-century alterations to the c. 1680 Mulford House also reflect the massing and layout typical of the type. Other significant examples of the type include moved buildings such as the c. 1725-1750 Rowdy Hall at 111 Egypt Lane in the Egypt Lane Historic District, the c. 1725-1750 Percy Hammond House at Hither Lane, and the c. 1725 William Babcock House at Middle Lane. The above examples all feature center entrances and three to five-bay facades. Well preserved examples of the Cape Cod type include the c. 1750 Miller House on Apaquogue Road in the Jones Road Historic District and the c. 1750 Conklin Eldredge House on Egypt Lane. The two houses are similar in their three-bay center entrance facades and center chimney arrangements. The Miller property includes an eighteenth or early nineteenth century barn and is one of the few eighteenth-century farmhouses in the village that retains a farm setting. A sub-type of the saltbox, locally referred to as the half house because of its abbreviated floor plan, is represented in the multiple resource area by two examples: the c. 1700-1750 David B. Mulford House at 177 Main Street and the c. 1700-1750 Isaac W. Miller House at 223 Main Street, both within the expanded village historic district. The Miller House includes structural evidence that suggests that this house type was designed in anticipation of later expansion into a prototypical saltbox house with a center entrance, center chimney and flanking parlors. The examples appear to provide significant insight into planned sequential building programs, which may have been commonplace in Eastern Long Island communities during this period. During the last three decades of the eighteenth century, East Hampton's architectural development continued to parallel that of New England. A distinctive group of buildings built during this period and characterized by full two-story arrangements, formal and symmetrical facades, streetside orientations, gable or gambrel roofs and classically derived details suggests the influence of the popular Georgian style and bears a resemblance to the eighteenth-century architecture of the Connecticut Valley. Seven such buildings survive within the multiple resource area, most in close proximity to the core of the village. The finest and most unusual example of this type and stylistic influence is the Clinton Academy at 151 Main Street in the expanded village historic district. Built in 1784-1785, the building's design incorporated a symmetrical five-bay center entrance facade, a gambrel roof with pedimented dormers and a dome covered belfry. The exterior of the academy departs from East Hampton's traditional use of shingles for the exterior, utilizing brick in the construction of the gabled end walls and clapboard siding at the facade. Other prominent examples of buildings designed in this more formal mode in the expanded village historic district include the "1770 House" at 143 Main Street and the late eighteenth century Sherrill House at 128 Main Street, both designed with gable roofs, central chimneys and five-bay center entrance facades. Outside of the village core, the 1799 Miller Dayton House at 19 Toilsome Lane illustrates the same pattern and is detailed with a distinctive leaded-glass transom light above the principal entrance. Two large houses with formal plans and facades and gambrel roofs are known to have been built in the village during this period. Only one, however, the c. 1799 Jeremiah Miller House at 117 Main Street in the expanded village historic district, retains its historic massing and proportions. With the sole exception of the academy building, all of the above buildings were built with shingled exteriors, although their appearances may have been modified by the use of more regular shingles and the application of paint to street facades . Several three-bay side entrance houses located in the expanded village historic district are representative of smaller houses built in the village during the later eighteenth century and in plan bear a resemblance to the half-houses built earlier in the century. The Samuel G. Mulford House at 146 Main Street is a two-story version of the type, whereas the Gardiner House at 48 James Lane is only one story in elevation. Both houses feature short entrance halls with large internal chimney units located immediately to their rear. Windows in both houses are relatively small and narrow in proportion. Both houses feature simple shingle exteriors expressive of East Hampton's vernacular eighteenth-century building traditions. East Hampton experienced little growth during the first half of the nineteenth century and became increasingly isolated from the social and economic changes which characterized this era elsewhere in New York and New England. Although grain was raised and milled in East Hampton for local consumption, stock raising remained the principal agricultural activity of the area as late as 1860. The rustic and vernacular character of the eighteenth-century village also appears to have persisted well into the nineteenth century. Writing as late as 1884, a visitor to East Hampton described the unchanged appearance of the village as consisting of a single, broad and grassy street bordered on each side by large poplar trees and " ...ancestral cottages, shingled to the ground with mossy squares of old gray shakes... The side of these ancient buildings, sweeping to the earth from their gabled eaves in curves of old age, and tapestried with their faded lichens, were more tent-like than house-like." Buildings constructed during the first half of the nineteenth century continued to reflect the vernacular building traditions of the later eighteenth century, although an awareness of changing, nationally popular architectural styles was occasionally demonstrated in the design of doorways, fenestration and cornices. Massive center chimneys were gradually replaced by smaller chimneys with shallow fireplaces usually placed inside gabled side walls and eventually by even smaller chimneys accommodating stoves. Heavy timber framing and shingle siding continued to predominate until the introduction of new framing techniques and mass-produced building materials in the 1870's and 1880's. A significant concentration of three early nineteenth century houses with exceptional Federal style interior details is included in the Jericho Historic District. The three houses are all believed to have been built by members of the Jones family, prominent East Hampton builders during the eighteenth and nineteenth centuries. With the exception of elaborate Federal style entrance enframements on two of the houses, the exteriors are plain and sheathed in the traditional manner with shingles. The interiors, however, incorporate elaborate mantelpieces, door and window casings with panelled corner blocks, and stairs with turned newel posts. The one-story Jones Homestead, a component of the Jericho district, features an elliptical archway separating the stairhall from the kitchen passageway, as well as a finely carved plaque above and between two doorways in the parlor featuring popular motifs of the period, i.e., a pineapple, two flanking willow trees and sunbursts in the upper corners. Other outstanding houses in the multiple resource area, which illustrate Federal style detailing and taste include the c. 1835 Abraham Huntting House at 15 North Main Street in the North Main Street Historic District, the 1829 Josiah Dayton House at 35 Toilsome Lane, and the early nineteenth century Dickerson House at 129 Egypt Lane in the Egypt Lane Historic District. In addition, several earlier houses in the multiple resource area were altered during this period to reflect current architectural tastes. Representative of these efforts are the early nineteenth century alterations to the eighteenth-century Lyman Beecher House at 84 Main Street in the expanded village historic district. These alterations resulted in the elimination of features such as the saltbox shaped roof and central chimney mass and included the construction of gable end chimneys and the installation of a particularly distinctive late Federal style of doorway with a panelled entablature and a leaded-glass transom. Relatively few buildings were constructed in the village of East Hampton between 1840 and 1860, an indication of the static nature of the village's population and economy during this period. Those which survive generally exhibit characteristic Greek Revival style details including trabeated entrances, six-over-six double-hung window sash and shingled exteriors. In residential construction, two plan types predominated: the two- story, five-bay center entrance house exemplified by the c. 1840 Baldwin Cook Talmage House on Briar Patch Road and a three-bay side entrance house commonly associated with attached urban rowhouses of the period. This latter house type is represented in the multiple resource area by two largely intact (examples: the two-story Henry Tuthill House at 4 James Lane, built in the mid-nineteenth century and located in the expanded village historic district, and the single story William Bennett House, built in 1849 at 43 North Main Street in the North Main Street Historic District. The Bennett House is significant as one of the few well-preserved small houses remaining in the multiple resource area from the nineteenth century. A third example, the William Osborne House at 207 Main Street in the expanded Village Historic District, features a highly sophisticated Greek Revival style entrance composed of flanking pilasters, a complexly molded cornice and a leaded-glass transom and sidelights. Early twentieth century alterations, however, have compromised its external nineteenth century form. Two other categories of significant resources, windmills and cemeteries, also date from the first half of the nineteenth century but are representative of practices established earlier in the village. Three windmills in the multiple resource area, all built between 1804 and 1806, are significant reminders of East Hampton's eighteenth and nineteenth century agricultural practices. They also represent a significant technological response to the flat topography and continuous off-shore winds characteristic of Long Island's south shore. Two of the windmills, the 1804 Gardiner Windmill at 36 James Lane in the expanded village historic district and the 1806 Hook Windmill at North Main Street in the North Main Street Historic District, were built by Nathaniel Dominy V, a prominent East Hampton clockmaker and millwright. Both were built on the sites of eighteenth-century mills and both continued to operate commercially into the first decade of the twentieth century. The 1804 Pantigo Windmill, currently located at 14 James Lane in the expanded village historic district, was originally built nearby on the Village Green by Amagansett craftsman Samuel Schellinger. It operated commercially until 1879, when it was broken in a windstorm and subsequently abandoned. The Pantigo Mill was moved to its fourth and final site in 1917 and rehabilitated by Gustav Buek. A fourth mill in the village, the 1809 Hayground windmill now located on Further Lane, was originally built and operated in the neighboring community of Hayground; it was moved to its present East Hampton site, near the ocean, in 1950. Although significant from a technological perspective, its history is unrelated to East Hampton and it is therefore not included as a component of the East Hampton multiple resource area. The two historic cemeteries in the multiple resource area are both prominently situated in open greens at the north and south ends of the historic core of the village. The South End Burial Ground is located between Main Street and Pantigo Road in the North End Commons and represents a contributing element of the North Main Street Historic District. The locations of the two cemeteries in such highly visible and public locations is symbolic of the cultural importance attributed to memorializing the dead from East Hampton's initial settlement through the nineteenth century. Although both cemeteries were established earlier, the majority of the stones in each consist of flat, rectangular or slightly arched headstones representative of the first half of the nineteenth century. In both cemeteries, the majority of the stones are arranged in parallel rows. Landscaping consists only of grass and a picket fence around the perimeter. Several stones in the South End Burial Ground mark the graves of seventeenth-century settlers. Early graves in the North End Burial Ground date from the late eighteenth century and are remarkable for their elaborate and finely detailed engraving. During the mid-nineteenth century, a small but growing number of visitors including clergymen and artists "discovered" East Hampton's attractive qualities and began visiting the village during the summer months. At first these guests boarded in old houses in the center of the village, supplementing the income of many of the community's year round residents. After the Civil War, affluence and a desire to build more modern and convenient quarters led some summer residents to begin building their own cottages and villas between the village center and the ocean in what later became known as the Summer Colony. The first of these houses reflected the popular picturesque tastes of the period and were built of light-frame construction in variations of the Stick, Chalet and Italianate styles. The complex massing, extensive wooden ornamentation and bright colors of these houses contrasted sharply with the vernacular traditions of the old village. Several were designed by prominent architects, including James Renwick Jr., while others appeared to have been derived wholly or in part from popular pattern books of the period, again departing from East Hampton's long-standing reliance on local builder-designers. Only two examples of the picturesque summer colony architecture of the 1870's remain intact within the multiple resource area, and both examples are located within the expanded village historic district. "Sommariva," the principal dwelling on the former Charles P.B. Jeffery estate on Jeffrey's Lane, was designed in 1873 as an Italianate villa with a hipped roof, bracketed cornice and wraparound verandah. (In 1914, the house was moved a short distance on the same lot and slightly altered.) The nearby "Chalet," also on Jeffrey's Lane, was built in 1879 for Jeffrey's brother-in-law in the then popular Chalet style, still evident in the unusually broad roofs, and wide overhangs of the house. Other important houses of this period and stylistic taste remain in the expanded village historic district but were altered beyond recognition later in the nineteenth or early twentieth century to reflect currently fashionable styles. This phenomenon is illustrated by the Satterthwaite-Thompson House on Ocean Avenue, built in the Stick style in 1874 and remodelled into a Colonial Revival style house c. 1910. East Hampton experienced greatly increased popularity as a summer resort after 1880 and, subsequently, large tracts of land southwest of the village core were subdivided and developed for big summer houses between 1885 and 1910. This period of growth and development in the village coincided with the national popularity of the Shingle style and resulted in an unusually large and significant collection of distinctive Shingle style summer houses largely concentrated in the southwestern half of the expanded village historic district. In design, these shingled houses are characterized by their organic quality and informality and are often created with wide verandahs, picturesque gable and gambrel roofs, dormer windows, polygonal bay windows, towers and small-pane window sash. Many of the larger houses in this idiom were designed by prominent regional architects, including I.H. Green, Cyrus Eidlitz, J.G. Thorp, J.C. Lawrence and William B. Tuthill. Others were designed and built by local builder-architects, including Frank Grimshaw, James L'Hommedieu and especially George A. Eldredge. Representative examples of Shingle style summer houses in the multiple resource area include the Everett Herrick House on Ocean Avenue, designed by I.H. Green in 1887, and the George Munroe House on Ocean Avenue, designed by Green in the following year. Both houses are located in the expanded village historic district and are designed with picturesque gambrel roofs which usually reduce the large two-story masses of these houses and contribute to their informal and unostentatious appearance. Both houses were widely imitated throughout the Summer Colony. Other important examples of the style also included in the expanded district are the 1907 Arthur Van Brunt House on Ocean Avenue, designed by J.C. Lawrence, and the 1898 Schuyler Quackenbush House on Lee Avenue, designed by Cyrus L.W. Eidlitz. The Quackenbush House and several other later examples of the style occasionally incorporate modest Colonial Revival style details, especially Palladian and elliptical windows, and simple Tuscan Doric porch columns. Several early twentieth century examples, such as the 1903-1904 S. Fisher Johnson House on Georgica Road, designed by J.G. Lawrence and built by George A. Eldredge, incorporate pseudo-half-timer and stucco gables suggestive of the influence of the Tudor Revival style. Although distinctive Shingle style houses continued to be built in East Hampton as late as the l920's, as evidenced by the 1927-1928 Grantland Rice House and the 1927-1928 Ring Lardner House, both on West End Road, the relative prominence of the style in large-scale houses appears to have waned after 1905, as historical eclecticism gained broader popularity. Although the major late-nineteenth century architectural developments in East Hampton were related to the design of large summer houses for the wealthy, other buildings in the multiple resource area are significant in demonstrating the parallel growth of East Hampton's year-round community. The multiple resource area includes a number of intact middle-class houses built between 1875 and 1910 which illustrate modest versions of popular Victorian period house forms. Most of these houses feature steeply pitched cross-gabled roofs and are sheathed in unpainted shingles. Some examples, such as the house at 9 North Main Street in the North Main Street Historic District, include elements suggestive of the Shingle or Queen Anne style, such as the multi-pane upper window sash and the elaborate brick and stone masonry chimneys. Perhaps the best expression of East Hampton's middle-class development in this period is the Buell's Lane Historic District, which includes a concentration of relatively small, shingled late-Victorian period houses and a small, Queen Anne style Roman Catholic church. Although many of the houses in the district refer to the Shingle style in their use of materials and some of their detailing, in form, most reflect house configurations commonly associated with speculative middle-class suburban development during the late nineteenth century. The Shingle style aesthetic is also reflected in non-residential buildings of the period. The Odd Fellows Hall at 26 Newtown Lane, designed by J.C. Thorp and built in 1897, includes features associated with the Arts and Crafts style, such as broad hipped roofs with wide overhangs, a deeply recessed round arched entrance, and outward flaring sill courses. Its shingle exterior, originally stained dark green, and its small-pane casement windows with transoms are also familiar elements of the Shingle style. The Edwards Drug Store at 153 Main Street in the expanded village historic district is more closely related to East Hampton's residential examples of the Shingle style. Designed by George a. Eldredge and J.C. Lawrence and built in 1901, the two-story shingle building is designed with a distinctive gambrel roof and a gabled facade, including a second story oriel window and an attic level fanlight. A third non-residential building in the multiple resource area, which illustrates the nearly universal popularity of shingles as an exterior material in East Hampton, is the United Methodist Church at 35 Pantigo Road in the north Main Street Historic District. Built in 1901, the design of the church incorporates an unusual combination of picturesque form and massing, symbolic Gothic inspired windows, doors and tower, and informal shingle siding. Artists in East Hampton built studios for seasonal use that often expressed their individual tastes, desire for privacy, and fondness for nature. The first permanent house and studio in the village was built in 1884 for the prominent landscape artist Thomas Moran at 229 Main Street in the expanded village historic district. Designated a National Historic Landmark in 1966, the design of the Moran house blends picturesque elements and details such as irregular fenestration, oddly shaped dormers and a turreted riel window, with a textured shingle exterior and scale reminiscent of East Hampton's vernacular architecture. Other artists were attracted to the scenic beauty and tranquility of the fresh water ponds at the western edge of the village. In 1889, Robert and Amanda Sewell built a house and studio at the east side of Georgica Pond named "Briar Patch" by later owners (demolished in 1930). "Briar Patch" was followed in the late 1890's and early 1900's by the construction of six additional houses on the east side of the pond, now included within the Briar Patch Road Historic District. Built for prominent members of East Hampton's art community, including sculptor John Heywood Roundebush, playwright, actor and sculptor Augustus Thomas and architect James Lawrence Aspinwall, most of the houses are linked by their secluded natural settings and their architectural simplicity. Two of these houses express East Hampton's vernacular traditions and are designed with saltbox-shaped roof lines and large studio spaces. All but one of the houses in the district are covered with unpainted shingles. Contrasting with the simple and rustic character of the Briar Patch Road houses is the nearby estate of artists Albert and Adele Herter named "The Creeks." Designed by Grosvenor Atterbury and built at the head of Georgica Pond between 1898 and 1899, the estate house, studio, service buildings and grounds are formally arranged according to an axial plan aligned with the view of the elongated pond and the ocean beyond. Architecturally, the buildings on the estate bear a strong relationship to the arts and crafts aesthetic, in particular, the broad hipped roots with wide projecting eaves, the diamond-paned fenestration and the stucco exteriors with wooden string courses. The red tile roofs, however, give this major estate complex a Mediterranean character foreign to East Hampton's eighteenth and nineteenth century architectural traditions. Renewed interest in America's colonial history and architecture and an appreciation for East Hampton's eighteenth- century building stock led some summer residents in the late nineteenth and early twentieth centuries to acquire and remodel early houses in the Colonial Revival style. One of the earliest manifestations of antiquarian interests and attitudes in the multiple resource area is illustrated by Edward DeRose's 1885 remodelling of the c.1799 Jeremiah Miller House at 117 Main Street in the expanded village historic district for use as a summer residence. DeRose's efforts drew the attention of the local press and, although significant changes were effected at the interior, many original features were apparently retained or reproduced. De Rose further demonstrated his antiquarian propensities by constructing a small cottage to the rear of the main house, built in the form of a late eighteenth or early nineteenth century windmill (117B Main Street). 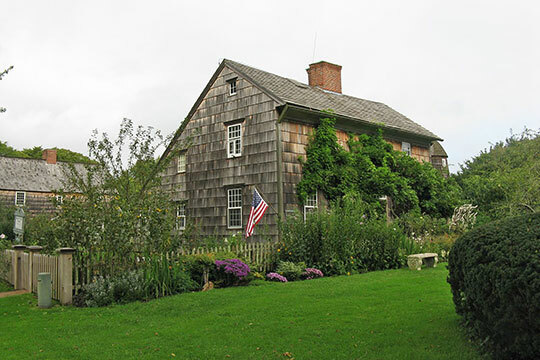 In 1908, Gustave H. Buek of Brooklyn followed De Roses's lead and purchased the early eighteenth-century saltbox at 14 James Lane in the expanded village historic district and began a lengthy and somewhat more conscientious "restoration" of the house, which again drew attention to East Hampton's architectural heritage. Buek also acquired the abandoned 1804 Pantigo Windmill, moved it to his property at 14 James Lane and restored it to working order. Other similarly inspired summer residents chose to purchase historic buildings near the center of the village and relocate them to more desirable suburban lots throughout the multiple resource area. Examples of this approach include the early eighteenth century Bates House, moved from Main Street in 1894 to its current site on Ocean Avenue in the expanded village historic district, and the early to mid-eighteenth century "Rowdy Hall," moved from Main Street to Gay Lane in 1895 and to its present location at 111 Egypt Lane in the Egypt Lane Historic District in 1925. In both instances, the houses were remodelled following their move by prominent architects who accentuated those features or added new ones which were thought at the time to reflect Colonial period architecture. Other early houses, including the c. David Huntting House at 102 Main Street and the early eighteenth century Osborne office at 135 A Main Street, both in the expanded village historic district, were moved back on their lots and updated in order to enhance their livability and setting. Although the relocation of these historic buildings and their subsequent alteration diminished their integrity by today's standards, these efforts contributed to the survival of East Hampton's early vernacular buildings and are significant in documenting the antiquarian attitudes of a small but influential segment of East Hampton's population in the late nineteenth century and early twentieth centuries. New construction in the Colonial Revival idiom in East Hampton during the late nineteenth and early twentieth centuries included nationally popular expressions of the Colonial Revival style used in the design of houses in the summer colony and brick commercial buildings in the village business district as well as a small group of houses directly modelled after East Hampton's vernacular eighteenth and early nineteenth century architecture. The former category is well represented by the 1899 William M. Carson House on Lee Avenue in the expanded village historic district, designed with a well-proportioned Georgian style gambrel roof with dormers and Federal style entrance porch. This stylistic category is also represented by the extensive remodelling of earlier summer residences such as the W.A. Wheelock House in 1929 and the Satterthwaite Thompson House in 1894-1995, both located in the expanded village historic district. Other prominent examples of Colonial Revival style domestic architecture in the multiple resource area include the 1910 Francis Newton House on Georgica Road, designed after standardized plans by Grosvenor Atterbury, and the 1931 Shepard Krech House in the Briar Patch Road. Historic District. The portion of East Hampton's Main Street business district encompassed within the expanded village historic district includes a series of six significant Colonial Revival style commercial buildings built of brick between 1906 and 1918. Although several of these buildings illustrate only a superficial reference to the style, others, including the fifth and sixth post office buildings at 41 and 1 Main Street, respectively, are quite sophisticated in design, given their modest scale. The 1918 East Hampton National Bank Building at 27 Main Street is closely related to the Colonial Revival style character of the business district but might more accurately be described as Neoclassical in design. The bank building is the most elaborate of East Hampton's early twentieth century commercial buildings and includes a distinctive balanced facade composed of brick pilasters, limestone columns and an entablature, and a round-arched entrance with flanking round-arched windows. Although the majority of East Hampton's Colonial Revival style architecture was based on a free interpretation of eighteenth and early nineteenth century New England architecture, three surviving houses in the multiple resource area, all located in the Jones Road Historic District represent designs based closely on local vernacular prototypes. The three houses were all designed by amateur architect Mary Talmage and built between 1910 and 1915 as part of her plan to develop high quality rental units on her property on Jones Road. Named according to their sequence of construction, they include the First Mary Talmage Cottage (1910-1911), a shingled saltbox with a Georgian style entrance and panelled shutters, the Fourth Mary Talmage cottage (1912-1913), a full two-story house with a shingle exterior and a Federal style entrance with a leaded glass transom and sidelights and the Fifth Mary Talmage cottage (1914- 1915), similar in design to the fourth cottage but including the added feature of flanking saltbox-shaped wings. A fourth house in the same district, designed by the regionally prominent Long Island architect J.C. Lawrence, was built in 1914-1915 for New York City dentist T.W. Onderdonk in the form of an early eighteenth century East Hampton saltbox. Although originally contributing to this enclave of real and reproduction eighteenth and early nineteenth century houses, unsympathetic alterations to the Onderdonk House have completely obscured its original design. During the early twentieth century other nationally popular forms of historical eclecticism rose to prominence in East Hampton, coinciding with the village's increased popularity as a summer resort for the upper class. The Elizabethan or Tudor Revival style, inspired by picturesque late-medieval vernacular architecture in England, is especially well represented in East Hampton's early twentieth century architecture. Characterized by picturesque massing, half-timber and stucco exterior surfaces, and fasciated chimneys, the style appears to have had a unique appeal to a group of affluent summer residents who felt a close social and ethnic affinity with England and who were keenly interested in East Hampton's seventeenth-century English origins. Some of these residents even clamored to re-name the village Maidstone as a means of highlighting the English lineage of the village. One of the first significant houses designed in the Elizabethan or Tudor mode was that of architect J.G. Thorp, built in 1892 for his own summertime use. Located at 12 Woods Lane in the expanded village historic district, Thorp's design featured a twin-gabled facade, elaborate fasciated and corbelled chimneys and diamond-paned casement windows. Although the house is broadly characteristic of the style, especially the work of Richard Norman Shaw, it also embodies some of the elements characteristic of East Hampton's late seventeenth century architecture. One of the largest and most prominent examples of the style in the multiple resource area is Thorp's extensive 1911 additions and alterations to the Miller-Papendiek-Poor House at 181 Main Street in the expanded village historic district. The remodelling of this house involved the construction of large wings and the application of a stucco exterior detailed with carved bargeboards and beam ends. Other early and significant examples of the style include the 1911 half-timber and stucco East Hampton Free Library by Aymar Embury II at 159 Main Street and the 1917 Lorenzo Woodhouse Playhouse by F.B. Hoffman at 80 Huntting Lane, both located within the expanded village historic district. By the l920's the Elizabethan or Tudor style became especially popular in the design of large estate complexes near the ocean. The 1922 William Jenny House designed by Polhemus and Coffin at 140 Egypt Lane and the 1926 Ellery James House, designed by Roger H. Bullard at West End Avenue are excellent representatives of a large and highly intact group of such houses. The revival of historic English architectural forms is also evident in Thomas Nash's St. Luke's Episcopal Church at 18 James Street in the expanded village historic district. Built of stone in 1910, the cruciform church district strongly evokes the image of a late medieval English parish church in its massing, scale and texture. Some of the large estate houses built in the village between 1910 and 1930 illustrate more freely interpreted versions of English historical eclecticism, often stressing prominent and picturesque roofs and chimneys. Where these houses are situated near the ocean their organic massing often echoes the shape of the nearby dunes. A number of these houses, such as the 1912 John Erdman House on Lily Pond Lane in the expanded village historic district, designed by Albro and Lindeberg, and the 1918 Robert Appleton House on Old Beach Lane, designed by Frank Eaton Newman, incorporate roofs with rounded edges and swelling surfaces suggestive of English thatched roofs. Others, such as Lindeberg's 1915 Alcott House on Lily Pond Lane and J.C. Lawrence's 1913 Second Hollister House, exploit gently flared roof planes. Despite its huge scale, the 1922-1924 Maidstone Club on Old Beach Lane, designed by Roger Bullard, is also imbued with an English vernacular character, largely due to Bullard's skillful arrangement of picturesque roof forms, turrets, chimneys and gables. A relatively small number of buildings in the multiple resource area illustrate eclectic designs based on generalized interpretations of Spanish or Mediterranean architectural traditions. Although the Spanish Colonial or Mission style became a popular architectural expression in some areas of the United States, the style was much less common in New England. The most imposing example of the style in the multiple resource area is "Cima del Mundo," the 1926 summer house of Eltinge F. Warner on Lily Pond Lane. Designed by Robert Tappan, the house is characterized by its low and horizontal massing, stucco exterior walls, and prominent tiled roofs. Other examples in the multiple resource area include Albro and Lindeberg's 1905 Cockcroft House and 1910 Hollister House on Lily Pond Lime in the expanded village historic district, which utilize round-arched openings and wooden pergolas to suggest the style. East Hampton's resort era prosperity deflated rapidly with the advent of the Great Depression in the early 1930's. With the exception of Aymar Embury II's 1931 Georgian Revival style Guild House at 156 Main Street in the expanded village historic district, no significant construction occurred until the conclusion of the Second World War. A number of prominent estates were abandoned, and ultimately destroyed by fire or through demolition, and others were broken up and subdivided. Since the 1950's, however, the village has regained much of its former affluence, brightening the prospects for the preservation of its historically and architecturally significant building stock. The comprehensive documentation which forms the basis of this nomination has already contributed significantly to local preservation initiatives and policies and it is believed that National Register listing will lend support and recognition to these efforts. French, J.H. Gazetteer of the State of New York. Syracuse: R. Pearsall Smith. 1860. Hefner, Robert J. Ed. East Hampton's Heritage: An Illustrated Architectural Record. New York and London: W.W. Norton and Company. 1982. Rattray, Jeanette Edwards. East Hampton History. Garden City, New York: Country Life Press. 1953. Rattray, Jeanette Edwards. Up and Down Main Street: An Informal History of East Hampton and the Old Houses. East Hampton: The East Hampton Star. 1968. Peckham, Mark, Village of East Hampton Multiple Resource Area, 1988, nomination document, National Park Service, National Register of Historic Places, Washington, D.C.